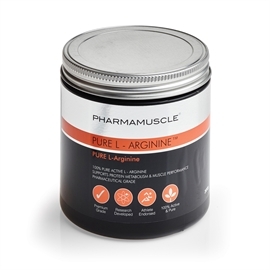 PURE L-Arginine is 100% Pure Active L-Arginine - a Nitric Oxide booster. As a naturally occurring amino acid it helps to improve circulation, promote rapid recovery from exercise to enhance endurance and increase lean muscle strength, power & mass. PharmaMuscle uses innovative new scientific technology and the highest grade sources to produce the most pure, highly absorbable, bioactive L-Arginine supplement. Arginine is a semi-essential amino acid which means that under conditions of high protein turnover, like exercise, arginine becomes an essential amino acid that must be supplemented. As well as being an essential building block of proteins, arginine directly stimulates muscle growth, improves circulation and boosts immune defence. The L-Arginine Difference – What Makes Our Formula Better Than Other Supplements? Purity – L-Arginine is presented in its purest form to ensure the active components have the highest possible efficacy. Bioavailability – This premium product provides a highly absorbable source of arginine which can rapidly potentiate muscle growth and hormone release. Quality – We guarantee that only the highest quality sources are used to formulate this supplement to ensure maximum efficacy of this premium quality product. The nitrogen-containing side-chain in arginine is cleaved to produce Nitric Oxide (NO) which is a potent vasodilator. NO is termed the 'endothelium derived relaxation factor' which determines which parts of the body receive extra blood flow. NO acts specifically on the muscle surrounding arterioles that supply blood to major organs and skeletal muscle to cause them to relax. This relaxation reduces the resistance to blood flow which increases the rate of blood flow and therefore the nutrients and oxygen carries with it. Oxygen is often the limiting factor in muscle endurance and power which is greatly improved by increased delivery due to the vasodilatory effect of NO. Furthermore, higher blood flow removes lactic acid and other toxins from muscle tissue which can limit performance and increased supply of nutrients provides the raw materials for muscle growth at a faster rate. Arginine has been shown by scientists to potentiate the release of growth hormone. In a study involving infusion of arginine or saline (as a control experiment) into healthy adults, it was found that relative to the control experiment, arginine triggered an increase in serum growth hormone levels. Further studies have outlined the biological mechanism of this action to show this occurs because arginine blocks the inhibitor of growth hormone, somatostatin. The graph shows the results of a study of the effect of arginine and exercise on serum GH levels. Relative to the normal levels of GH in the blood represented by the placebo, it is evident that arginine supplementation causes a significant increase in the concentration of GH in the blood. Furthermore, exercise and arginine supplementation together work synergistically to potentiate an even greater increase in serum GH levels. The high purity of our L-Arginine supplement ensures that it is completely absorbed and rapidly reaches the site of action to increase growth hormone levels, stimulate muscle growth and accelerate recovery. High intensity physical activity creates an increase oxidative pressure in every cell as the rate of respiration increases. This increases the generation of free radicals which can cause irreversible damage to cells. L-Arginine has been shown to have antioxidant properties by scavenging these free radicals to neutralise the dangerous effects of oxidative stress induced by exercise. The reduced oxidative stress on the body functions to improve general health and in particular the bioactivity of T-lymphocytes are an important arm of the innate immune defence of the body. L-Arginine has additionally been found to significantly impact the rate of tissue recovery. Whilst improved immunity and GH release due to L-Arginine helps to speed up repair of damaged tissue, L-Arginine acts via another mechanism to increase wound repair. Studies have found that arginine supplementation increases the deposition of collagen in damaged tissue which acts as a scaffold for new tissue growth to repair damage via a mechanism independent of anabolic hormones. Exciting new research is underway to delineate exactly how this happens. Our ultra-pure, highly bioactive L-Arginine formula not only stimulates new muscle growth but accelerates muscle recovery to increase endurance & strength. Designed specifically by our in-house nutritionists, this product has been carefully formulated using the newest scientific refining technology and the highest quality sources to ensure that L-Arginine delivers results. Highly acclaimed and recommended by leading sport science experts for the superior quality and efficacy of L-Arginine accelerates muscle growth. We recommend taking L-Arginine along with the high purity WHEYMAX® Hydrolysed Whey Protein Isolate to facilitate rapid muscle recovery and growth. The nutritional specialists that have been part of the formulation process have recommended that L-Arginine should be taken between 1 to 2 times per day as required and as directed by your personal trainer or healthcare professional. Brill for helping performance when playing active sports like football or rugby. Fast delivery, high quality product and effective...Result!